Tal Arbel uses a tracked ultrasound probe on a brain phantom, an artificial brain used to test the algorithms developed in the Medical Imaging Lab. Big Science requires widespread co-operation, but smaller-scale collaborations can also lead to major advances. 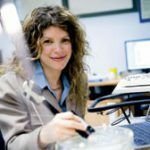 Just ask Tal Arbel, of the Centre for Intelligent Machines, who is making brain surgery even more precise. The McGill electrical engineering professor—along with Louis Collins, Director of the Image-Guided Neurosurgery Research Lab at the Montreal Neurological Institute—is using a new combination of ultrasound and magnetic resonance imaging (MRI) to guide surgeons through complex procedures. During surgery, the brain swells and shifts position by as much as five centimetres, rendering pre-operative images less useful for precise surgical guidance. To solve the problem, Arbel developed a multi-modal imaging system that matches ultrasound images taken during the operation to MRI acquired prior to surgery, in order to correct for specific brain movement. The system gives surgeons updated MR images to guide them. “Nobody has looked into embedding these types of computer vision techniques into neurosurgery before,” says Arbel, who expects MNI surgeons will start testing the guidance system within the next few months. “This is going to make brain surgery far more accurate and efficient,” says Collins, adding the process will better protect healthy tissue from the cut of the knife, reducing post-operative complications and patient trauma. Arbel’s research is funded by the Canada Foundation for Innovation, the Natural Sciences and Engineering Research Council’s (NSERC) Discovery grants and the Collaborative Health Research Projects program, a joint initiative of NSERC and the Canadian Institutes of Health Research.